A cauliflower soup can be made in a number of ways. There is something very pleasant about the taste and aroma of cooked cauliflower, plus there is always an added advantage of a smooth texture, something you always want in a creamy soup. Now when I say creamy soup (which this is), I do not mean that it contains added cream. You may add cream to it, if you want. I just add some semi skimmed milk and that works fine. Clean, peel (where ever required) and chop all the vegetables into big chunks. Place them all in a pressure cooker. Add 2 cups of water and pressure cook until the first whistle and then simmer for 5 more minutes. Alternately cook the vegetables in a large pan with a lid and cook till the vegetables become soft. Meanwhile heat the oil in a small pan used for tempering or a small frying pan. Add the sliced garlic and on a low heat fry the garlic until evenly light brown on all sides. Be very careful not to burn the garlic. Now add the cooked vegetables and the garlic in a blender. Give it a zush, blend well and strain it through a sieve. This will help remove the tomato seeds. Now add the warm milk little by little to reach the desired consistency and add salt and pepper. Voila! It is that simple. 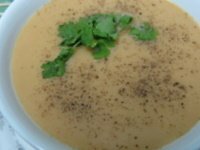 Enjoy your creamy cauliflower soup. Variation :- You can add just cauliflower, mushrooms and potato instead of the other vegetables. Proceed with the recipe. This will give you a white color soup.